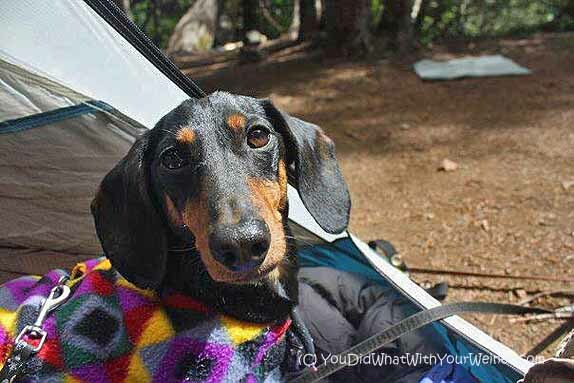 About 5 years ago, when I was first dating my now husband, I took him and Chester to one of my favorite overnight backpacking spots. 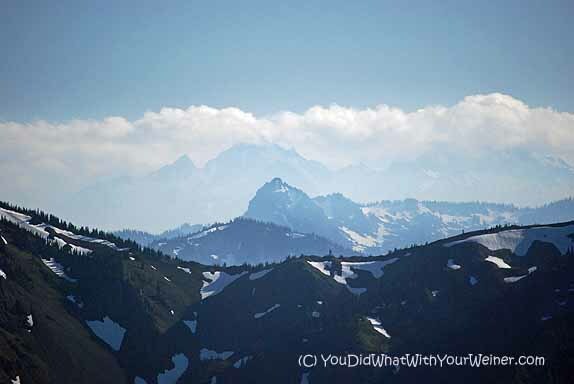 We hiked to Marmot Pass on the Upper Big Quilcene trail to camp. 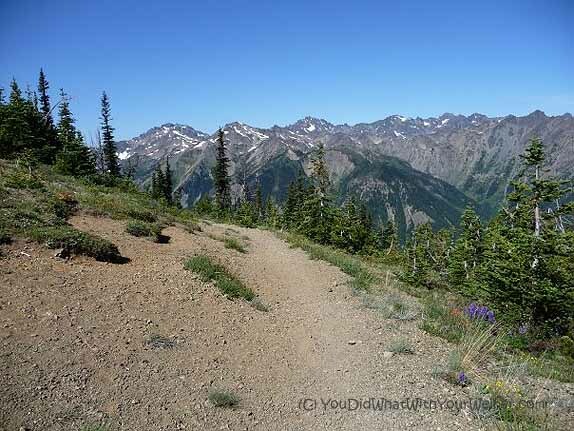 Dog’s aren’t allowed in the Olympic National Park but this trail leads to a 5,000 pass on the boundary of the park that gives you amazing views of the Olympic Mountains. 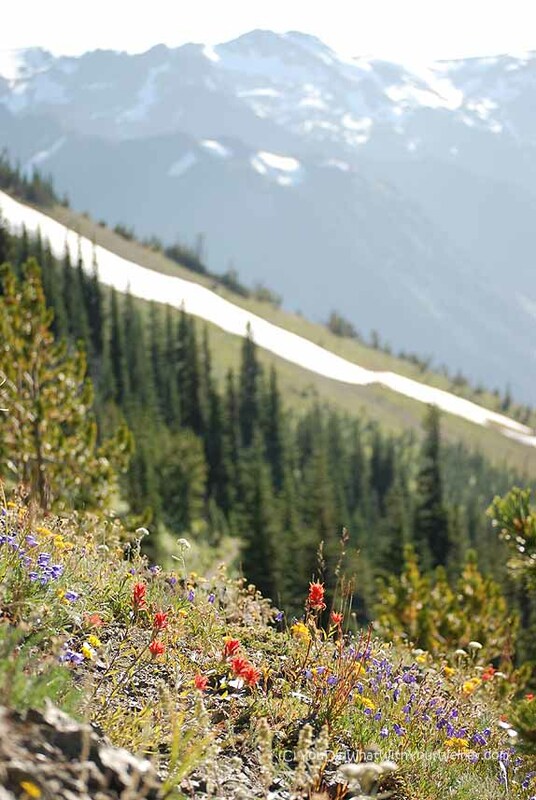 This dog-friendly trail really captures most of what the Olympics have to offer including mossy trees, rivers, wildflowers, and mountains. At this point, my boyfriend was still trying to impress me so he played down the fact that he had hardly ever hiked before and played up his enthusiasm for hiking and camping with Chester and I in the woods. He was an avid mountain biker so I figured that he knew enough about being active in the outdoors to know what he was signing up for. The next morning we wanted to do a “day hike”. 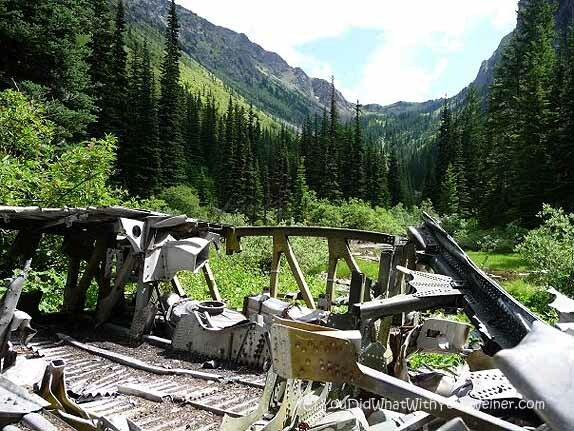 I thought my boyfriend would love to check out the Tubal Cain Mine and airplane wreckage a mere 17 miles RT (trail description) from our camp spot. When I told him the distance of the hike, he shrugged his shoulders and said “let’s go”. It was going to be the longest hike that Chester has ever done but I figured he could handle it since he had been hiking for a long time. I packed up enough water and snacks for me and Chester. My boyfriend loaded his stuff in his pack and off we went. It was really hot that day so I was drinking a lot of water. Above 5,000 feet there are no trees and the trail is covered in fine shale. The shale heats up in the sun, radiating head upwards. Without the shade of trees, the sun is relentless. This is where the problems started. On the hike down from the pass to Tubal Cain Mine, my boyfriend made the comment that he didn’t have much water left. He showed my his little hydration bag with about a cup of water left in the bottom and I was shocked that he had brought such a small amount of water. He KNEW we were hiking 16 miles, which, by my count would take about 6 hours figuring in breaks and exploration of the mines. We continued to hike and he was soon out of water. He was starting to get hot and tired and was now really thirsty….and grumpy! I was afraid to do so because I had only brought enough water for myself and Chester but I started sharing my water with him. II knew he had to drink something or risk dehydration. I thought MAYBE if we sipped the water gently it would last us all until we got back. I watched as he gulped with abandon every time we stopped. I tried to hint that we needed to drink water sparingly but it was clear that he was not about to do that. We ran out of water at the mine so we were facing an 8 mile hike back above treeline in the blazing sun with no water. Out of desperation I decided to chance it and declared that I was going to refill my hydration bladder out of the stream. I knew I was risking giardia but without sufficient water we would be risking so much more. I filled the bag from a swiftly-moving part of the stream just under a spot where it filtered through some moss. On the way back, Chester was clearly getting overheated and started to lag behind us on the trail. I frequently gave him cool water and quick breaks but coaxed him along so we could get out of the sun sooner. When we got back to camp, Chester laid down and didn’t get up for a long time (by boyfriend did too, ha, ha). When I tried to call Chester for dinner, he wouldn’t get out of the tent. I tried to scoot him over by the food bowl but he just took a few limps and stopped. I was panicked that I had pushed him too far and he had hurt his back (something Dachshunds are notorious for)! I brought the food dish to Chester and started checking him out after he was done eating. I pushed on his spine, and manipulated his little legs, but there were no signs of discomfort. I moved to his paws and that is when I noticed it. The skin in between his foot pads was red and raw. The poor little guy had gotten some of the hot, sharp shale chips between is pads and they had grated around while he walked, rubbing the skin raw. We had never hiked on that kind of trail surface so it never even crossed my mind that it could be a problem. I put some salve on his paws but they were still raw in the morning and he didn’t want to walk. I had to carry him out in a little backpack I wore on the front (in addition to carrying my 40 lb backpack). Looking back on our trip, we remember the good parts and can laugh at the really, really bad mistakes we made. Everything turned out ok in the end so we can chuckle how grumpy my now husband got. 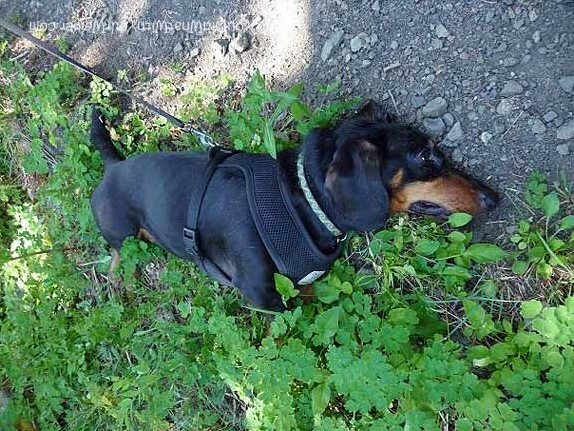 We can brag that our 12 lb Dachshund “hiked 16 miles once!” and show our friends the funny pictures of me carrying him out. There were some important lessons learned on this trip though! My first mistake was me assuming that my newbie-hiker boyfriend was “smart enough” to get what hiking was really like and make his own decisions about the amount of food, water and supplies he needed for an all-day hike in the sun. I should have taken it more seriously and gone over a “checklist” of what we needed to bring so he was better prepared (a nice way to tell him to bring enough stuff without making him feel incompetent). I also should have paid more attention to Chester’s cues and noticed the raw spots on his feet sooner. I should take precautions next time like clearing the shale from his feed often, trying to get him to wear little booties (although that has been a miserable failure in the past, or try putting Musher’s Secret salve on his feet to help keep things from sticking between the foot pads. I am glad for the experience because now we know better and can share our mistakes with others so that they can learn from them. Pretty much everyone who has hiked for a long distance or camped in the backcountry has made mistakes in the outdoors too. Join the #STPLive Twitter Chat on Thursday, March 27th at 6 pm EST/3 pm PST to find out what mistakes other people have made. We can laugh together and learn together so that our outdoor adventures are safer and more enjoyable. That’s quite a hike to break the then boyfriend in on. The first hike Al did with me, he almost died. LOL He was out of shape, and his idea of hiking was vastly different from mine. He wanted to wander slowly through the woods, I wanted to get where we were going. Mind you, a 700 foot gain. He lived, and now he knows better. Ha, ha. That is what my first, and last, bike ride with my ex-boyfriend was like. I was doing it for exercise and to get to the destination while he wanted to peddle a little, look at the ducks, peddle a little, look at the flowers……… Needless to say, it didn’t go well. I guess everyone has to learn from mistakes. Glad this turned out well for everyone and you did marry him. We did Marmot Pass this last summer and it was incredible! The man and I pushed pretty hard to get all the way to the top of Buckhorn Mtn the first day and then turned around to camp below the pass. Our companions didn’t make it to the top. The next day we all hiked the opposite direction through Dungeness Valley from Tubal Caine and I swear, there’s something vaguely jinxed about that area. We had plenty of water, but it took much longer than we anticipated (for a reasonably flat trail) and ended up just barely making it back by sunset. And of course, I was the only one who had grabbed a headlamp… Beautiful area though. I really want to go back and do the mines. The opposite direction? 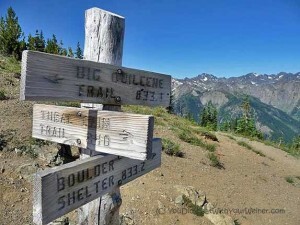 You mean you camped, hiked out, drove to the other trailhead and then hiked to the mine? Ahhhh…got it. I am not sure I could go that way with the dogs. Never looked at a map so see if it goes inside of the park. Ahhh — the water! We’ve had a few close calls and now carry iodine tablets just in case we need to refill in a stream. I’ve actually had worse luck on seemingly easy trail runs when I’m crazy thirsty…no iodine tablets then, of course. Yeah…iodine is yucky. I usually carry some in my overnight pack but didn’t have it in my day pack. Apparently it wouldn’t hurt to throw some in there just in case. So how did the water from the stream work out? No giardia problems? That was a smart move. Since you were on your way out, even if you did contract something, it wouldn’t hit you until you were safely out of the wilderness. Better to deal with something treatable than dehydrate into delirium. No problems with the water. It’s not the first time I’ve drank right out of a stream but it is always a risk. You are probably right about junk not hitting until we were out but we did say overnight at camp again. Ooh, those kinds of grumpy-but-dangerous situations are the pits! Glad you came through all right, though. Well enough that you’re married now! I’ve never taken Elka on that kind of a hike, but on the walks we do take, she doesn’t like drinking water. She’ll fling around a little travel bowl we’ve got, but not actually ingest any of it. Silly dog! Yeah. It’s kind of a balance between “we’ve got a problem here” and “I don’t want to cause a problem here (with you). I have never had a problem with Chester’s feet since and it’s not like I check them all the time. It IS the first thing I check if he is lagging behind or limping now. 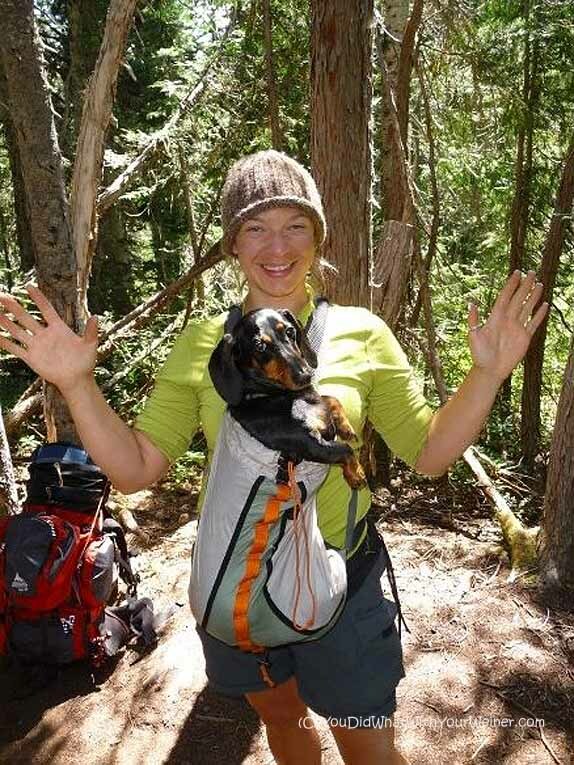 Backcountry evacuation is SO much easier with a small dog. There are advantages and disadvantages to small vs big dogs but I was thanking my lucky stars he was small when I had to carry him out. Even 12 lbs gets REALLY heavy after 6 miles. Man, that sounds like a rather uncomfortable hike! I have had to watch my water and it is not a pleasant experience at all! You’re photos are absolutely amazing though! How beautiful! I’ve definitely made the mistake of not taking enough water on some long hikes, especially on those days where you just don’t think it’s that hot. And I usually end up giving most of the water to my furry German Shepherd mix who tends to overheat. I’m guilty of being more prepared for him than for me! Beautiful pictures! Your dogs are adorable! 3/4 of the gear and supplies I carry in my pack are for Chester and Gretel 🙂 My mistake is usually not DRINKING enough water. I have to drink by my watch because I don’t notice when I feel thirsty soon enough. That was definitely a learning experience Jessica! About 20 years ago I had a similar, though much shorter, hiking experience like your husband. I was a fit ‘casual’ hiker, one who did indeed “stop to smell the flowers” on my hikes. I had a job interview (seriously) where they wanted me to hike up to a certain waterfall that was about 2.5 miles one way uphill. I thought, “No problem”. Well, they obviously wanted to get there fast, so I had to keep up while answering “interview questions”. I did pretty good, though they could tell I was not quite used to it. We got to the falls, ate lunch, then hiked back. By the time I got home, I could barely walk I was so exhausted, LOL! Needless to say, we all have those types of experiences. Poor little Chester! Our little dogs are so tough, yet can get hurt without us knowing until after the fact. Glad it all worked out though! Give Gretel & Chester a hug for me! Man, Silas is such a wimp. I think the longest hike he’s done is four miles or so, and on that one I let him get *completely* covered in near-microscopic ticks. But, as I’ve said here before, “hiking” where we are is mostly wandering around in perfectly flat parks, so there is no real motivation for distance. We’re lucky in Western Washington that ticks are rare. I can’t imagine having Chester and Gretel covered in those gross, scary things every time we came back from a hike. It would definitely be demotivating. At least nothing serious happened. Mom feels for you as a few years back when she was training for a marathon, Katie was her running partner. The last miles of a really long run, Katie was not wanting to run but Mom made her keep going. When they got home, there were bloody paw prints. They had been running on a slanted trail part of the way and it wore off two of Katie’s outside claws down to the quick. Mom felt just awful about not noticing and making Katie run but she also learned to pay more attention to us on runs and walks and to take us seriously. In the end, Mom ran a great marathon but also had a knee injury from those slanted trails. They are below the dike and slanted for run off, she never thought about how bad it would be to run there. Even the best dog parents find lessons to learn huh? I am glad Katie’s injury was not serious but I know that kind of thing can be very painful. I feel extra bad about Chester because he just wanted to please and follow me and I didn’t notice that he was in pain. Like I said, that is one of the first things I check now and I always check his feet a couple of times on a hike, whether he is acting strange or not. How funny – glad to hear it all worked out in the end 🙂 Our Alfie often wears his pads down when chasing his ball, but so far its never happened on a hike! First of all, stunning photos!! Secondly, holy cow – what a mess of complications in one trip!! I’m glad everyone (pup included!) made it out okay but man, that could have been bad! I’m not sure about Seattle/WA but I do know that here in CO, *generally* water from running streams are ‘safe’ to drink if you need to in a pinch (like the one you were in!). We always carry iodine/purification tablets in our packs but something like those filters straws would have been clutch for ya! And yes – never underestimate the power of checking and double checking that everyone is on the same gear/endurance/goals page!! Meh….I should be more careful but I have drank out of streams and rivers probably 10 times and never got sick. I did, however, have terrible food poisoning in Mexico once so I am sure I don’t want any sicky problems from it. But it is the same in Western WA – *generally* water is safe to drink. I should definitely put a few iodine tablets in my day-pack first aid kit though. I have some in by huge first aid kit but I had left that one back at camp. The husband puts his filter in his daypack for hiking because sans-water is definitely not a place we want to be! Sure, high up enough in the mountains, you’re probably safe to drink it, but why risk it when you don’t have to? Gravity filters are light! But we have been in the same place – pushing Moses a bit too far. And once he did cut a pad – but he’s too big to carry, so had to tough it out. No fun – I felt terrible. Wow! I always worry about pushing the dogs so hard and something bad happening. I remember when Lola was just 10 weeks old, we took her up on a short hike and she became really overheated – it was scary! Had to laugh about the water, my bf would’ve got an earful about that situation! Wow great story and glad it had a happy ending. That could have been serious. Hi there! Important tips and it’s never a mistake, always a lesson! Yoda and I nominated your blog for an award! Check it out at . and come say hi! Thanks for the Nomination. We appreciate it. Yeah…luckily those things can be laughed about later if no one got hurt…and even sometimes if they did 🙂 Now I bet you guys double check all of the time.